Two Coaches Gone, Who’s Next? Of course the day I decide to take most of the day off to rest, relax, buy a new bed, all that usual holiday stuff is the day that not one but two MLS coaches get canned. Teitur Thordarson in Vancouver and Carlos de los Cobos in Chicago. I’ve said for the majority of this season that I thought de los Cobos was on a short string and seeing how the Fire haven’t won a game since March, it was pretty obvious his time was running out. Frank Klopas will step in as interim boss and don’t be shocked if he ends up being the full-time head coach by the end of the year or the start of next year. Same goes for Tom Soehn in Vancouver who is taking over for Thordarson. Soehn has been comping at the bit to have a coaching gig since his days in D.C. and based on the way he helped form this club through the SuperDraft and the Expansion Draft I think he was doing some long term thinking for this club. I say that because both situations feel a lot like Kansas City when Peter Vermes outed Curt Onalfo a couple seasons ago. With Vermes as interim boss he had a big say in the coaching hiring and in the end he thought he was the man for the job. My gut tells me Soehn and Klopas will likely follow suit. Or at least one of them will. But why the black Monday, or pink(slip) if you will for these two? Simple, both had high expectations on them and neither came close to living up to them. 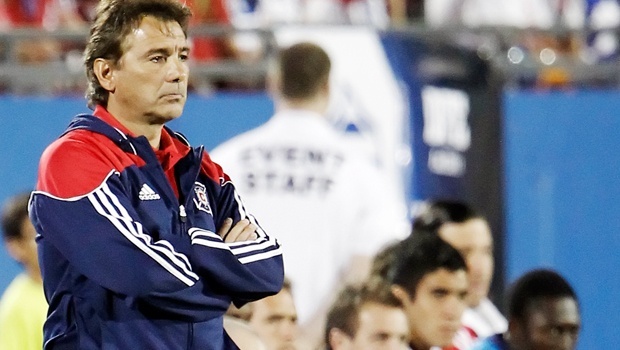 de los Cobos was a victim of not knowing how to coach in MLS properly. The Fire had the talent while he was in the Windy City but he never knew how to properly utilize guys like Marco Pappa, Patrick Nyarko, and others on the team. Instead he would complain about work ethic which in my opinion can be okay if the club is at least winning here and there. The Fire just weren’t winning and a lot of that fell on de los Cobos for not getting the most out of his guys. More than likely it was a situation of the players not really wanting to play for him. Up in Vancouver the expectations were too lofty for an expansion team from Thordarson. He went into the season saying he wanted to be a world top 25 team. Yes, top 25 in the world. After winning the season opener and battling back in a wild game with Kansas City, it looked as though the Whitecaps would be the expansion team to contend with this season, not Portland. Now, that isn’t the case. Vancouver hasn’t won in ages and when they’ve come close they give up a late goal at home and blow the three points. Take Kansas City off the table here for a moment as they’ve played two or three fewer games than both Vancouver and Chicago and you’ll see why both coaches got fired. KC may be the worst in terms of points right now but the Fire and the Whitecaps have no excuse considering the amount of home games each has played so far in comparison to KC. So this leaves us with who is next? Right now you could make a case for a couple guys like Aron Winter in Toronto (you know they just love firing coaches up there), Steve Nicol in New England (yup, he’s on the list as the Revs continue to be inconsistent this season), and Robert Warzycha in Columbus (he blew up the roster and now it is starting to show). Do I see one of these guys or someone else getting the pink slip at some point this season? No but it wouldn’t shock me. You have to remember at the end of the day winning is a big part of this and if these teams don’t win it typically comes down to the coaches. ugh, thank GOD de los Cobos is FINALLY gone!